Did you remember the first 360 VR Cameras? Back in 2016, 360Degree cameras were heavy, uncomfortable and expensive. About half a kilo in weight and working only when connected to an external computing device, a gaming quality PC, smartphone or game console, and roughly the price of $400 per headset. Despite bringing an exciting technology, for years, VR technology have required huge computation power, the creation of complex simulation using proprietary software and expensive, tethered goggles in order to view the experience. With the growth of 360Degree camera market, driven by extreme sports cameras like GoPro for example, the entry of all in one Android VR headsets, and options like Google Cardboard, the Virtual Reality world has gradually changed becoming far more affordable. The evolution that’s occurred in this technology, means it’s now ready for greater industry adoption. VR for everyone – but how? 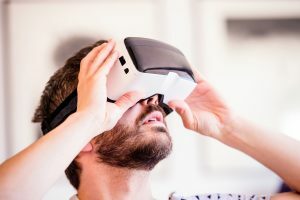 Thanks to the innovation of technology and the lower cost of production, the cost of devices has greatly decreased making the prospect of VR much more affordable. HTC, HTC Vive, Oculus VR and Pico, are manufacturing and selling the hardware at far lower price levels and this has driven much momentum in terms of VR adoption. Oculus’s pricing cut in the summer of 2017 demonstrated consumers had a big appetite for VR at lower prices, starting a boom what was widely followed by other businesses. This trend culminated in the launch of Windows Mixed Reality headsets at the end of last year, together with the announcement of multiple standalone VR headsets (where the price range varies from $80 to $500). The second way to make VR more affordable for the public is embracing Immersive Reality. While Virtual Reality is the presentation of an artificial environment that replaces the users’ real-world surroundings, Immersive Reality experience starts with filming the real world. So, why create a fully virtual world, when you can film the real one and overlay an interactive layer, delivering a truly immersive experience, to a large audience for a fraction of the cost? The increasing production of more Virtual Reality hardware both in terms of comfort and efficiency, at a wider range of price points than ever before, is bringing VR into the tech mainstream. Compared to the first 360 headsets, today there are compact, comfortable standalone devices available on the market, that provide better quality videos and can be purchased at more affordable prices. There are still a number of challenges VR should overcome in order to become a true mainstream consumer technology, such as getting more content, lowering prices even further, and upgrading the quality of their devices. But thanks to the Immersive Reality approach, the affordability of the cameras and the adoption of standalone hardware, we are confident VR will keep growing and it will be ready soon for a mass-adoption. It’s reaching an exciting tipping point. According to market predictions, VR is set to become a $38 billion Industry by 2026 and at 360dgrees we believe this is already happening, with VR driving massive change in the way we work, train, apply information, and interact with people.